Earring styles go in and out of fashion depending in large part on whether current hairstyles cover or expose the ear. Earrings on long loops are a very early style, usually made from gold. Finds from the Mycenaean & Minoan cultures of the 14th and 13th centuries B.C.E. include an integral 'boat' decoration, whilst finds from Phoenicia dating from the 7th-6th century B.C.E. have a decoration applied to the base of the loop. Plain loops - "hoop earrings" - remain popular in most cultures. 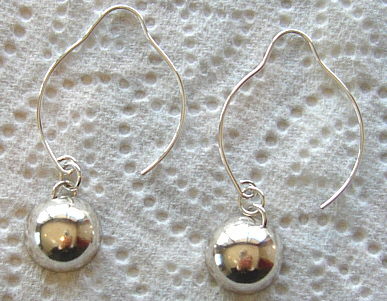 The 35mm short loops are hand-forged from Sterling Silver, as are the demi-spheres. N.B. Although they look rather lemon-shaped when off, once in the ear the earwires appear to be 'hoops'.